I had a Strip procedure at Dr.A clinic. 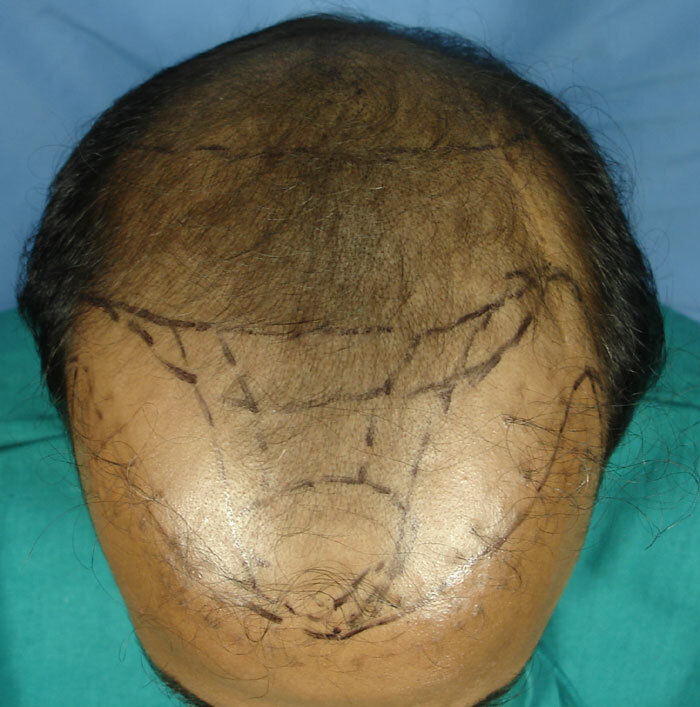 Dr. A - 3720 grafts. Strip. I will post your preoperative status and the HT pictures. Ripper’s case exemplifies one of the basic problems that afflict the HT field. The doctor who performed Ripper’s HT has been performing HTs for close to 30 years. In various countries. He is a PhD in Surgery (a rare but known qualification). He is a member of various organizations. Hair characteristics - fine calibre, straight donor hair. Ripper has been plucking the hair in the frontmost rows of the plugs over the years and he has noticed considerable thinning in the plugs. However, the scars and the pigment variation remains. There are various repair modalities in the current situation. I request forum readers to contribute with their suggestions as I feel that many forum readers, in similar situation, will benefit from this discussion. So much for PhD’s in surgery. Makes you wonder how many other men this doctor disfigured. Bosley Medical Group did a similar job on me back in the late 70’s, only the plugs were closer together and at least arranged to create the illusion of a somewhat believable hairline shape even they were obvious classic transplant corn rows. I’ll take a wild stab at a suggestion. Punch a couple of the plugs out and sew them up tight. Wait 8 months or so and see how they heal. all hair-organisations make more invailte scalps and destroy many many lifes from hairloss people in the last 20 years ,this is fact ,not more ! » I will post your preoperative status and the HT pictures. » qualification). He is a member of various organizations. » 6. Hair characteristics - fine calibre, straight donor hair. » the years and he has noticed considerable thinning in the plugs. » However, the scars and the pigment variation remains. » There are various repair modalities in the current situation. WTF? are you speaking in English here? Various options were discussed when planning the repair strategy. 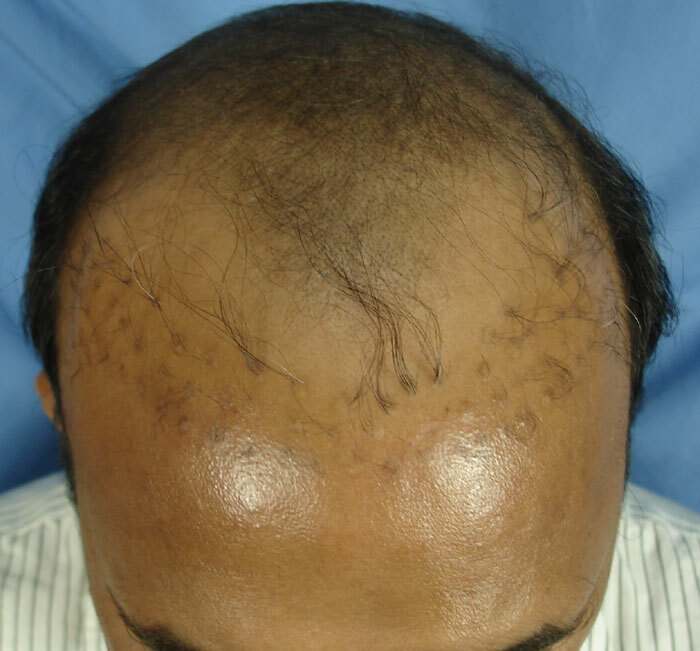 These options range from how to deal with the plug grafts, the visible scars and the hairline placement. 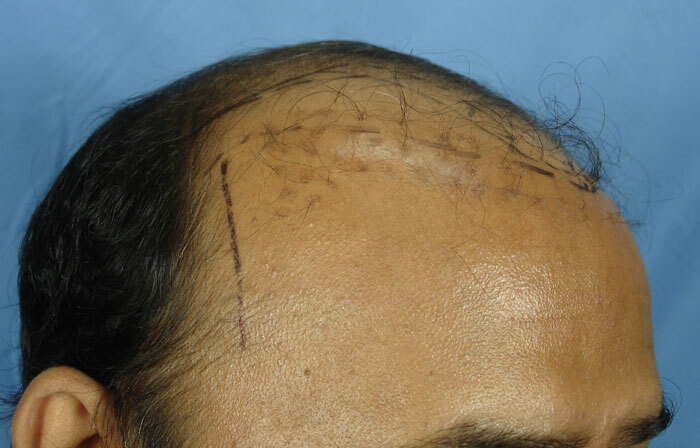 Option 1 - Excise the plugs and use the hair follicles so extracted to re implant the shotgun scars in the donor scalp area. 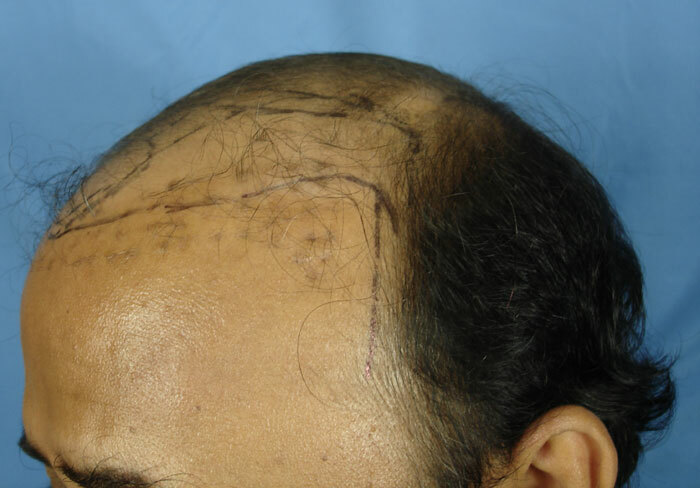 Option 2 - Electrolysis, laser or fue the hair in the plugs. Ripper has chosen to leave the plugs in situ, for the time being, while we transplant and recreate a new hairline. There are various hairline options. 2 of them are marked in the following pictures. The higher one with the deeper recessions allows us to transplant a larger area on top-crown area. The lower one provides more youthful front framing but leaves a larger crown-top area bald. Ripper also attempted a scalp expansion procedure few years back, (at some other clinic), but aborted it midway. He has a linear scar from where the balloon was inserted. Where are the actual photos of the procedure? In 1995 I had punch grafts in Delhi one (Dr.)?? Goel did the procedure and I have been suffering ever since. Huge Punch scars and had permanent shock loss and yield was next to nothing and I was very depressed. With in two years I had extensive hairloss and the plugs stood out, I started taking them out. I have travelled extensively for a cure but had none in the process I went through another nightmare, Flap surgery. I had a baloon placed on the left side. It was sooooooo painfull and I had it removed in India the Doctor here told me if I had waited another week the blood clots would have created major hassle. I am keenly following Hairsite from 1998 and I have to say It had been a great help. I have been closly watching D.A also and since his work I much admire, I decided to go ahead with the strip. I wanted a strip in the first procedure because I had to remove all the punch scars. I was lucky to recieve 3720 grafts and it was done in a day. 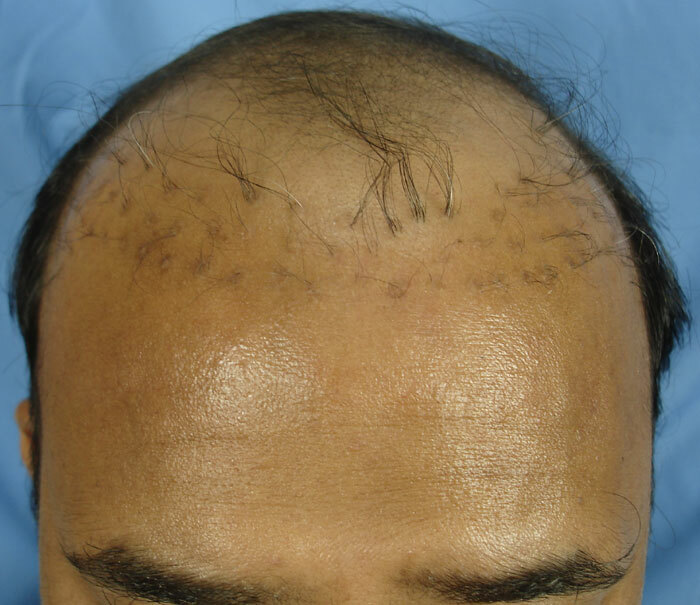 Dr.A gifted 320 grafts and a free test procedure of 25 thigh,28 chest and 10 beard. I was scared a little but was exited after all these years going through much pain, I was going to get my life back. Dr.A was just great and the wonderful staff, I had an great experiance. I hope and pray that I get back my hair. I request Dr.A to post complete procedure. Dr Fleming & Mayer of Beverly Hills ?? Dr Fleming & Mayer have HUGE reputations in the US for their work in reconstructive plastic surgery.Most HTP docs in the US know them. They have worked on patients suffering from sever trauma to the head due to HTP BUTCHERY, gun shot wounds, burns & motor vehicle accidents. Their work has been published in allot of medical journals. Both docs are PLASTIC SURGEONS not medical doctors performing cosmetic surgery. I am really surprised that they butchered you, really surprised. They are masters of tissue expansion; can you elaborate more on what they did to you? It takes everything I have not to comment. » It takes everything I have not to comment. In all my time on these forums, I have never read anything positive about F&M’s hair work. All I’ve read were complaints or worse. I grew up in Beverly Hills and would never go to them for hair work. Just my opinion and I rarely post negatively about any clinic or doc. 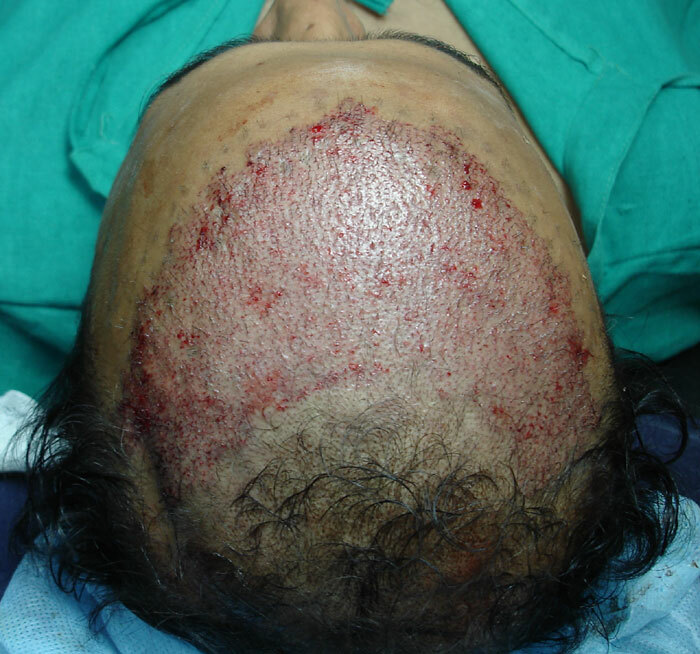 In ripper’s case, the scalp donor area had previous scarring due to shotgun harvesting. 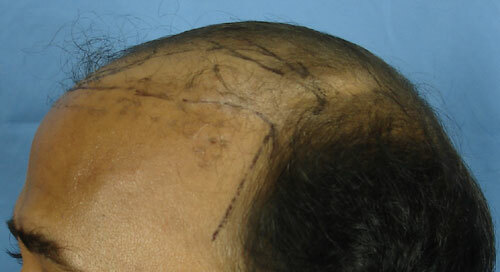 A strip FUHT procedure was performed to extract grafts as well as the shotgun scars. 3720 grafts from the scalp. It was decided to go for the lower hairline, rather than the deeply recessed look. At the same time, the limitations of the extensive graft requirement remain for the rest of the recipient areas in the crown. For this purpose a test bht session was performed for ripper. This is something we offer all our strip patients. The BHT grafts included hair from the chest, thigh and beard areas. 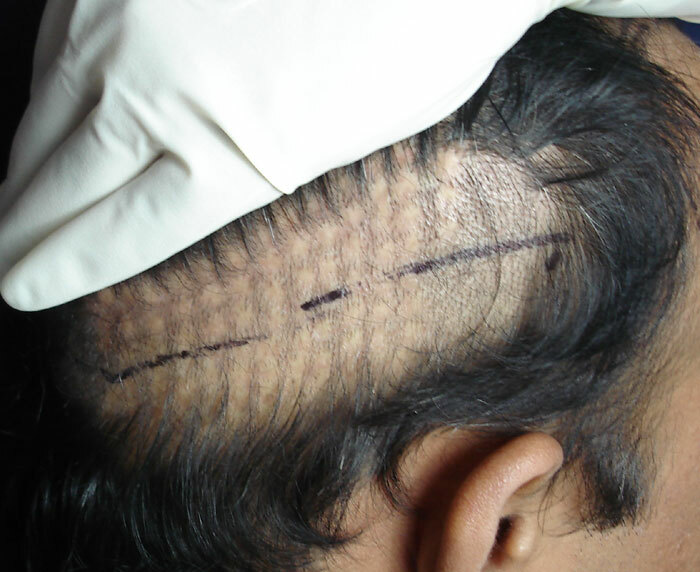 The beard hair grafts were transplanted into the scar left from the aborted scalp expansion procedure, on the left side of the scalp. You can see the depression towards the left edge of the recipient area. That is where the scar is. I, too, have been reading these forums for over a decade and I have never once heard anything close to a positive comment about Fleming and/or Mayer. They are the morons that perform the Fleming/Mayer Flap that has probably disfigured quite a few patients. They should not be allowed to practice “hair” procedures. Using beard hair on scared areas in the donor should be fine since it will be mixed in within more permanent hair. I would just be careful of the top head areas. Hope all works out for this patient. Damn it Hairtech, say it ! I am really surprised by what you guys are saying. When I was travelling around the states, consulting with plastic surgeons & HTP docs; F & M where recommended to me by almost every clinic. They had an almost mythical reputation for being able to repair the impossible. I really want this victim to elaborate on what F&M did to him. P.S I hope the puppet posters & charlatan clinics take note of the quality & size of Dr A’s photos & follow his lead. It isn’t called shotgun harvesting. It was simple large plugs taken and it was coined the “shotgun” appearance many years later. Damon, you say you are younger than me and that you got butchered. What exactly was done to you? This man should attempt to remove (by whatever method…looks like the plucking is slowly, but surely working) the frontal plugs, but otherwise HE SHOULD JUST GET THE BEST WIG HE CAN GET. He should be upfront about it when he meets people and explain what was DONE TO HIM by a seriously whacked out doctor back in the day. He should save his money, work a second job, and wait for HM. 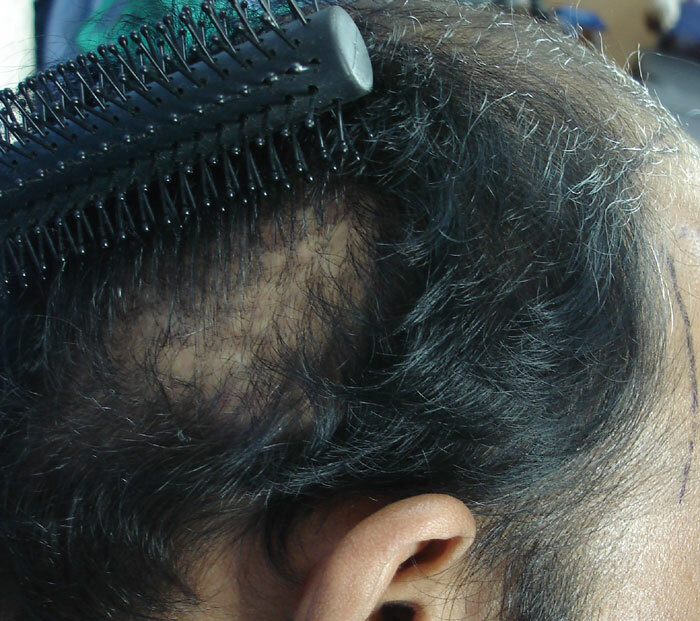 This man simply has too much hairloss, and way too little precious donor hair to even attempt to cover it up with body hair or any kind of BHT/scalp hair mix. It may not even work on him at all. If he goes the BHT route, he’d better be hairy as a bear, do a test patch (maybe twice), and have ALOT of money just lying around, and four or five years earmarked for being “in transition”. The wig, a small tasteful one, would be a much much much better option while he waits for HM. Sorry guys, when it comes to hair…there are no Jesus-like miracles yet. He can never buzz it either…not with those holes. Fleming and Meyer are practically minor war criminals. Following is the link to Ripper’s video showing his pre-op status. I am here to try and get a result and I will. Why dont U visit the famed ,as U call them, once.